Strongman is a sport that takes both strength and athletic ability. The events are geared towards the athletes that are overall strong. Some of the events are the log press, farmer's walk, truck pull, atlas stone, and many others. 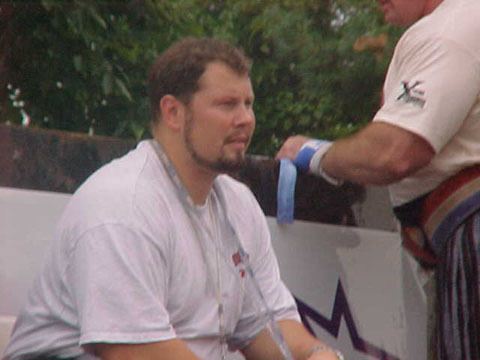 Martin Muhr - Martin is one of the greatest athletes to ever participate in strongman. He can do the splits a back flip and run the 100m in under 11 seconds. Martin's major weak point is his upper body strength. Magnus Ver Magnusson - The 4 time World's Strongest man ('91, '94, '95, '96). Probably the greatest strongman ever. This legandary Icelander has done it all in the feild of strength. Jon Valgeir Williams - Jon has resently competed in his 1st WSM. He hails from Iceland, he is carrying on the tradition of great Icelandic strongman. Jon stands 6'5" and weighs 350lbs and is very strong. 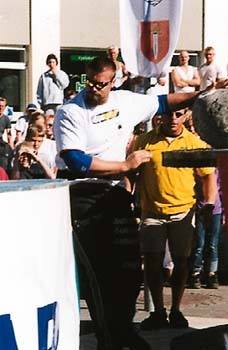 Juha Rasanen - Juha hails from Finland, a country that has produced a long and great history in strongman. Juha himself is starting to live up to that history. He stands 6'5" and weighs 290lbs. Juha is a very good deadlifter having pulled 345kg in competition. He is the current holder of the title of Finland's Strongest man.